By now you have likely seen the time-limited offer we tabled to quickly bring discussions to a close and reach a negotiated settlement with the Canadian Union of Postal Workers (CUPW). It provides a number of improvements and responds to the union’s concerns, including overburdening and health and safety. We want to provide clarity about the proposal regarding flex time and how it will impact overtime opportunities for Group 1 employees, particularly in mail processing. With our offer, there will continue to be significant opportunities for mail processing employees to take on voluntary overtime. The flexible work hours will only amount to a maximum of 10 per cent of the available full-time hours (at the national level). These flex schedules will be across the country. For the employees on flex schedules, the most common schedule will be four days of 10 hours with access to two hours of overtime on their scheduled days and access to overtime at premium on their three days off. The proposal to create 500 jobs over three years is to respond to the union’s request to give temporary and part-time employees more opportunities to become full-time. Full-time employees will still bid on schedules by seniority. The peak season temporary workforce proposal contained in the offer is a Monday-to-Friday solution and is not for weekend work. Therefore it will not impact overtime opportunities on weekends. For current full- and part-time employees, overtime opportunities will continue to be available. The offer contains significant improvements designed to conclude negotiations and get us all ready for the holiday season. It is all we can afford and represents the best opportunity to quickly resolve negotiations and deliver the holiday rush for Canadians. This offer also includes improvements to address the Union’s concerns around workloads and other issues. For example, for Urban, we now propose to suspend the application of clause 15.14 (compulsory overtime) for the duration of the collective agreement, and in updating volumes each year, we now propose to adjust the assessed workload of a route only if it results in a positive impact on the employee’s route. As you may be aware, the Union has filed a strike notice, which means they could begin strike action as early as Monday, October 22. I realize that creates uncertainty for you and your family about things that affect you personally, so I am writing to provide clarity and to reassure you as much as I can. With the Union’s strike notice, the Corporation could legally revert the terms and conditions of your employment to the statutory minimums under the Canada Labour Code. However, we do not intend to change the terms and conditions, unless the Union initiates some form of legal job action. Even if that happens, we would continue to provide you and your eligible dependents the following benefits: dental, vision & hearing and the Extended Health Care Plan (EHCP) – including applicable prescription drug coverage. There is more information in this terms and conditions document. We do not wish to cause any undue hardship to you and, if we implement new terms and conditions and receive requests for exceptions from employees who face extenuating circumstances that we could not reasonably foresee, we will review them in an effort to offer relief on a compassionate basis. We will continue to negotiate with the Union. Our goal is to reach a negotiated settlement that recognizes your significant contribution to the company’s success and sets us on a more collaborative path. I’m confident we will find a better way forward that supports all of you in your daily efforts to serve Canadians in urban, suburban and rural communities. I ask for your continued patience as we work through this process. Today, the Canadian Union of Postal Workers (CUPW) issued a strike notice, which means that there could be legal job action as early as Monday, October 22. Meanwhile, Canada Post remains focused on reaching a negotiated settlement. The postal service will continue to operate if the Union initiates any rotating job action. In past rounds of bargaining, rotating legal job actions have been isolated to one or two specific locations at a time, affecting those areas for a period of 24 hours. In that situation, Canada Post would continue to accept, process and deliver mail and parcels in all areas that are not affected. Once the temporary disruption ends, we would return to normal operations in the affected locations. We believe that a negotiated settlement is not only best for our employees but for every Canadian we serve. We continue to pursue that goal while trying to minimize the impact any disruption might have on the customers who rely on it every day. The collective agreement between Canada Post and CUPW-Urban expired January 31, 2018 but the terms and conditions continue to apply for now. Earlier today, Canada Post tabled an offer to the Canadian Union of Postal Workers (CUPW-Urban). The offer builds on an earlier one presented on September 7, 2018. It provides wage increases in every year of the proposed agreement, improved benefits and makes no changes to the pension. The offer also addresses many of the workload issues that employees face in handling more and more parcels every year. It adds more full-time positions in mail processing, greater opportunity for temporary and part-time employees, and improvements for the maintenance group. 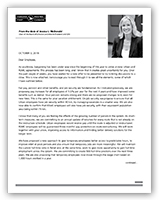 In a letter to all CUPW-represented employees, the Chair of the Board of Directors and Interim President and CEO Jessica McDonald explains how we address concerns in both the Urban and RSMC groups and confirms the company’s commitment to work with CUPW to grow and improve the business. While the conciliation process has concluded, talks are ongoing with the help of a mediator, and Canada Post continues to work toward a negotiated settlement.